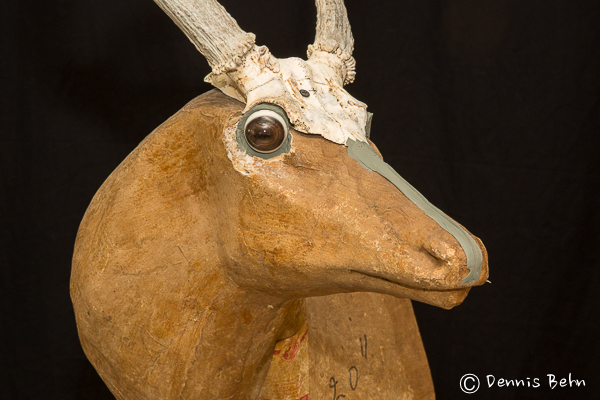 In my first post on this Blog (see Observations/Taxidermy-An Ideal and a Pledge) I mentioned how much taxidermy manikins have improved since the world of paper forms in the pre-midseventies era. 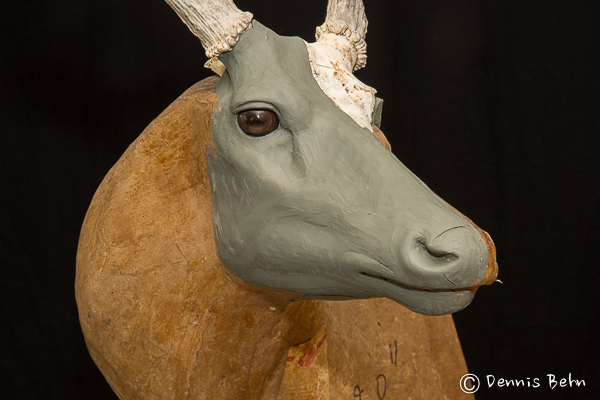 Because those forms had no pre-set anything, the taxidermist was required to model the face pretty much from scratch, on every singe mount. It was a time-consumer and certainly made symmetry much more difficult. 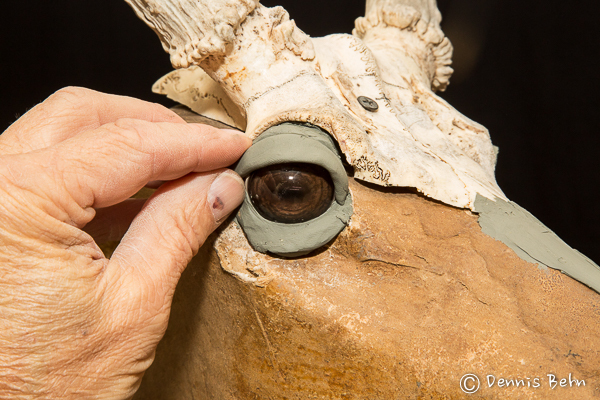 But my encouragement was that even though forms are much better today, it does not preclude the necessity of a taxidermist’s study of anatomy, in order to produce the best mount he can on every occasion. 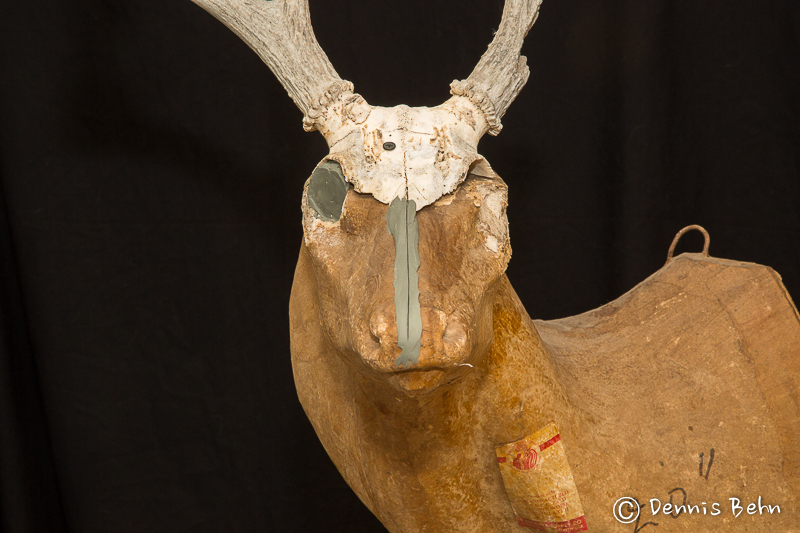 Every deer is different and on each mount you have to be able to deal with what you have to work with. And knowing what to do about each one of the scenarios that come up, will produce a better mount, every time. These points (nails) will now have to be located in exactly the same position in the opposite eye socket. As I mentioned all symmetry is measured from the centerline down the bridge of the nose. So mark the centerline at two points: one in front of the eye and one above and behind the eye. 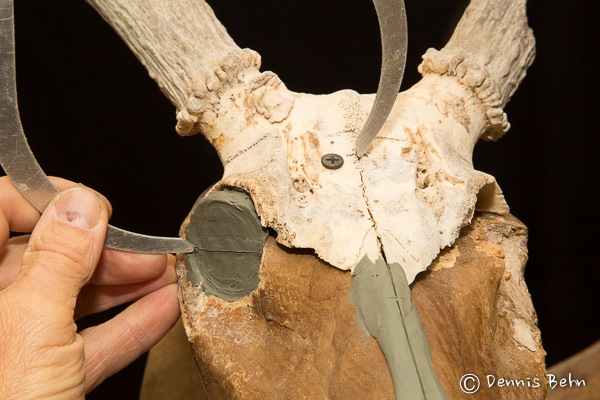 With a caliper measure from the centerline point to an existing nail (I started with the rear nail), and place a nail in the back of the opposite socket, the same distance from this point. Now do the same thing measuring from the front centerline point. Move the nail until it is the same distance from both centerline marks. Locate the front eye point in the same way. 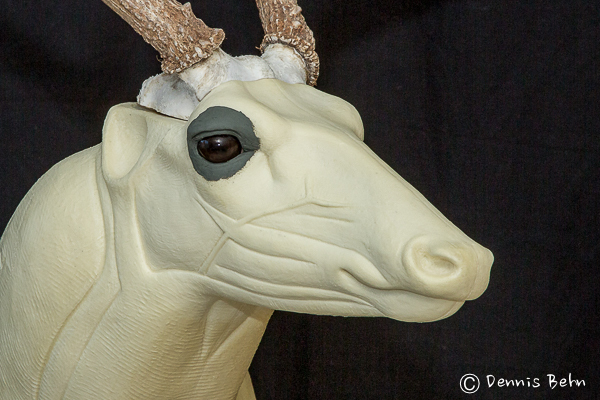 With the eye shaped, the nose and the lips come next. 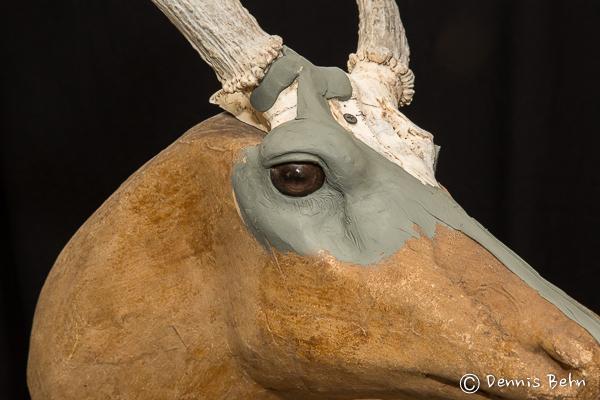 Final shape on the face would be the bottom jaw and side muscles all the way back to the jaw. It took me approximately 10 minutes to set the eye sockets. I spent 17 minutes sculpting the rest as you see in the photo above. The opposite side, then, should take another 17 minutes as well. So far that is 10+17+17= 44 minutes. If you wanted to add veins that would take an estimated 10 minutes more. 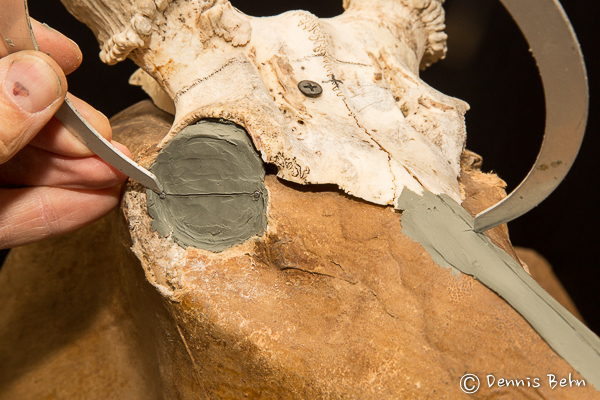 And finally, should you desire to completely “modernize” your sculpting to look like a foam manikin of today, expect another 15-30 minutes, or more. That is a crazy long total time frame of 1 hour 9 minutes at a minimum (inexperience could increase this time dramatically). Especially when you consider you could get to the same place (only with better symmetry and design) on a current form in only about 10 minutes! 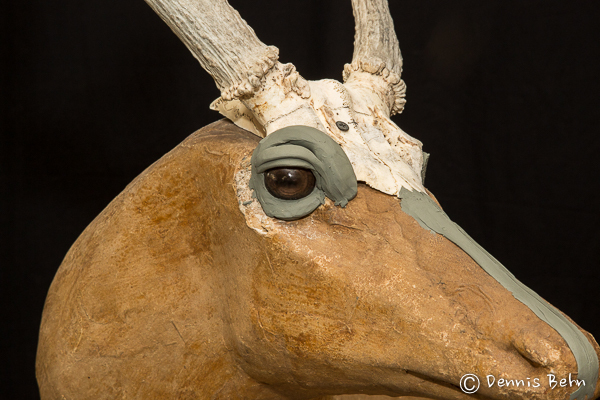 Back in the 70’s some old timers told me that my new forms with preset eyes and completely sculpted anatomy would turn the industry into a bunch of “paste-on” taxidermists. There would be no need to learn anatomy, they said, if all you had to do was to glue on a skin. 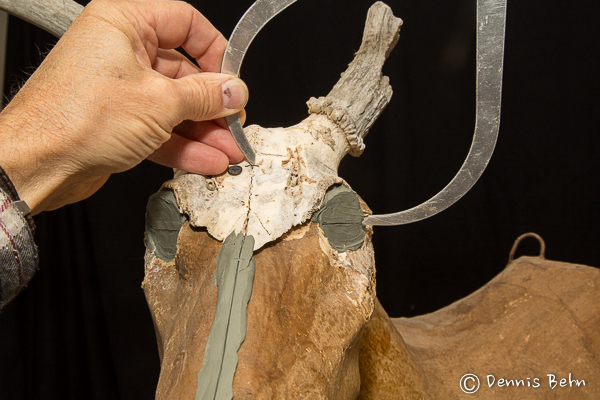 I personally believe, that a well sculptured manikin actually helps a taxidermist to learn and improves the basic mounting process. But having said that, there is always more that can be done on each individual mount to create a custom fit. 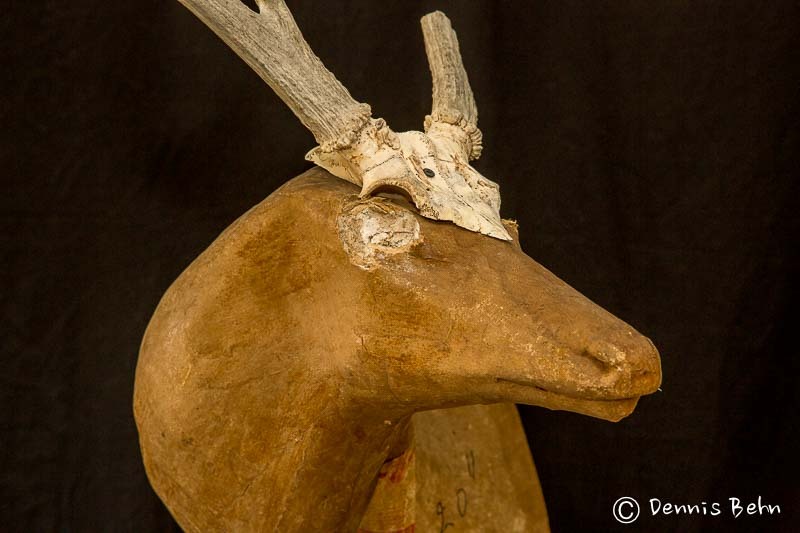 Taxidermy forms are limited in available sizes, yet there are millions (well a lot anyway) of sizes of deer, just like people. It can be very helpful to get to a place where you can do whatever needs to be done on each individual mount in order to obtain an even better result. Widening or narrowing a nose, or the whole head for that matter, should become second nature. 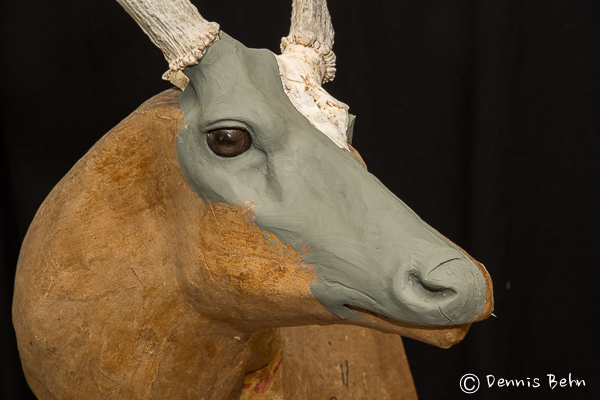 Add a Roman nose, take some foam off here, add some clay there, raise or lower the head, and the list goes on. You may not understand anatomy in the same way the original Jonas brothers did, but there is a lot you can do, and hopefully this Blog will help. No skin fits the same form in exactly the same way. Over the next few posts I will try to cover the reasons why this is the case and we will explore the entire mounting process and how to manage any problem that you may encounter. I can’t wait! What a blast form the past. Thanks Den reliving my childhood and teens right here and now….I’ve mounted on your foam mannequins since the first ones you dod for him that were molded right after you left Jonas and went to work for Larry. 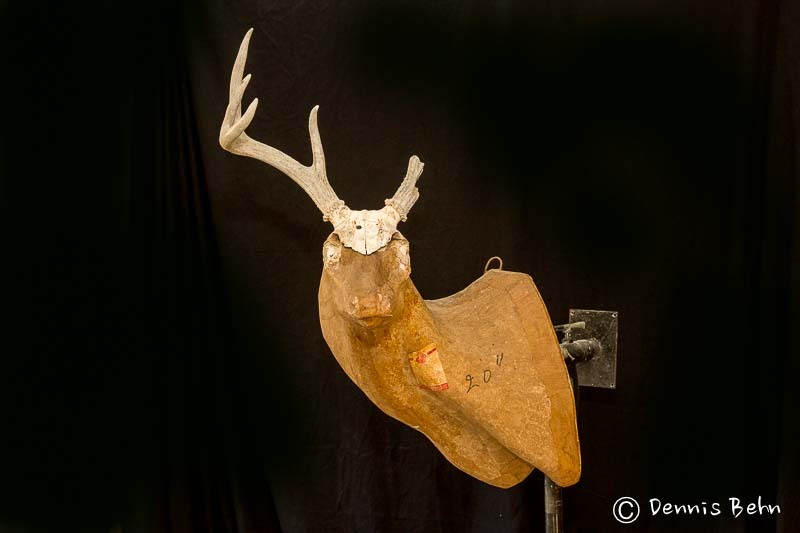 I just want to say that I really appreciate what you have contributed to the taxidermy industry, even more so after viewing and reading the flashback. I remember ordering , back in the 70’s, a deer form that was made of some sort of pinkish, orange resin with wood chips in it. Sanding would probably have been impossible. After that nightmare, why did I continue? 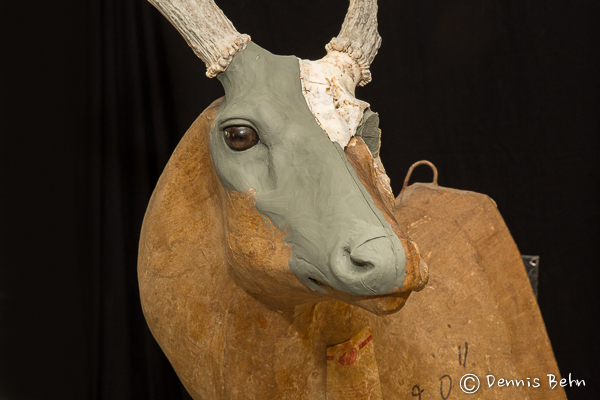 As an old TC-9 user, I could not have remained in taxidermy without the continuing efforts of artists like yourself. I admit to being totally dependent on the suppliers. Thanks for what you have done. I’m really enjoying your blog Dennis , I look forward to the new installments. Thank you for everything you’ve done for our industry. I grew up making Red Rosin Paper forms, it was the first job I had after school, I think my production started around the fourth grade, and that was many years ago. I remember when my dad read an article about a museum on the east coast somewhere and they were making items out of foam, the next thing I knew I had foam all over the backs of my legs from the expanding foam while sitting atop the crude backboards. 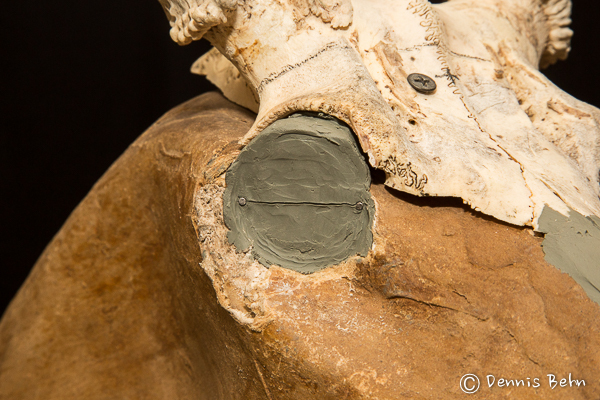 Sometimes the Plaster of Paris molds would break from the internal foam expansion, and removing the forms in one piece was heartbreaking at times. We used motor oil as a release agent plus other materials that never quite worked the way we hoped they would. Jumping forward to your forms has been an incredible ride and one that I am glad to have witnessed this change for the better. Thank You for helping us all out with the use of these modern materials and your fantastic sculpting ability. I don’t want to go back to the old days. Hey Buzzi, great to hear from you! Yeah, lots of changes in our industry, and fun to hear how far back you go. I don’t think I would like to go back either, but I guess I have to say it was fun to be a part of those “old” days as well! Keep up the good work and thanks for the encouragement.